BTS Says "Popularity is Like a Roller Coaster to Us"
BTS is on a Europe tour subsequent to an American tour, expressed their thoughts on their sensational popularity around the globe on the interview with The Guardian. 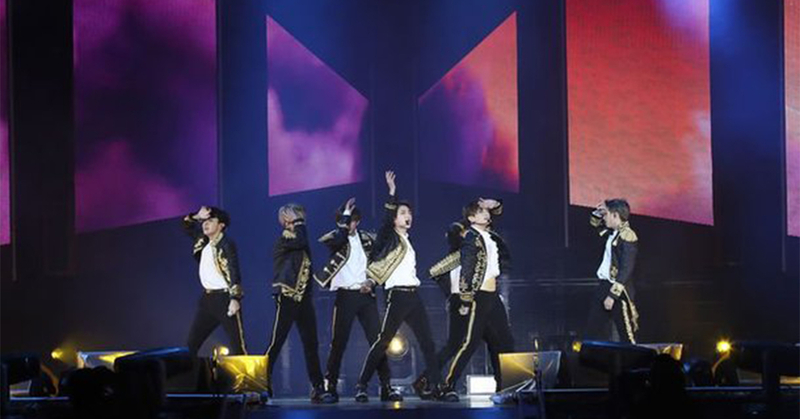 On the 11th, in an article titled "How BTS became the world's biggest boy band" The Guardian reported the interview regarding a behind story of the concert that took place in O2 Arena, London, England on the 9th and the 10th. Firstly, The Guardian delivered that BTS is being treated as the best musician in England. According to The Guardian, BTS performed in front of 40,000 fans in New York City Field and flew over to Europe via their private jet. In addition to that, robust guards are assigned throughout halls of hotels they stayed in. These worldwide stars are being provided with VIP treatment such as guards accompanying them even when they go to the bathroom, The Guardian said. BTS, however, showed an inattentive attitude towards such popularity. While being a history in the making in Korean music history, they expect it to come to an end some day. RM replied, "I fly in a private jet and perform in stadiums. but I don't think I own them. And I am very aware that it won't last forever. So I am just enjoying the ride. Once it's over, it's over". BTS is highly rated for their genuineness of the music and the ability to communicate with their fans. The fandom, 'ARMY' is also making an unprecedented history. However, the bigger the fandom and attention get, the more inconvenient it gets for the members. In respect to this, Suga said, "Popularity is what the light and the dark coexist." J hope also said that he has witnessed his fans trying to protect their private life. "Even if fans cross the line, I accept that as love for us" he added. Jimin showed tears at the American New York City Field stadium, which was a grand finale of their America tour. There has been a lot of speculations about the meaning of the tears, but many fans of his showed sympathy with how Jimin felt. Jimin let it all hang out that he was deeply moved by realizing how much love fans are giving them. Furthermore, we could hear an honest opinion on their thoughts on their own music. Suga commented on the issue of underestimation of K pop music. "I do not think a genre does not matter that much when it comes to music. "Classical music was also a popular music back then. So it is meaningless to say what is right and what is not since it is a matter of taste and understanding." BTS is on a world tour and also on an extremely hectic schedule. Would not they have a hardship from living wholly as members of BTS with no privacy? Suga acknowledged "There were a lot of times when I almost got 'burnout syndrome'. But there is nothing I can do about it and it is natural for any kind of occupations." he explained. BTS notified that they are going to be more active with tours and a new album. Jung-gook, who has been in a pitiable situation at the concert in England by getting his leg injured, did not hesitate to show his excitement about upcoming plans. He said, "I am so happy just by thinking of things I am going to be able to do." The Grammy has been BTS's new goal. Now Super Bowl is on the list too. Jimin displayed his confidence by saying "I want to show the most and the best possible." The Guardian pointed out genuineness of music as BTS's secret key to success. They analyzed that BTS has musically matured by breaking the mold as a typical boy band by showing not only success and boldness but also how they embrace failure and fragileness. The Guardian added, "BTS has made its big mark in the western music industry for the first time for a Korean artist. And they are gradually increasing the possibility of achieving their goal."